Make your little girl look even more adorable as you dress her up in this cap sleeves frock from the house of Zero. This frock is soft and super comfortable to wear. Designed to excellence with two front pockets and back button closure for fuss free dressing. This dress will go well with ballerinas. Styling Tip: Pair it up with sandals and hair band for a perfect casual look. 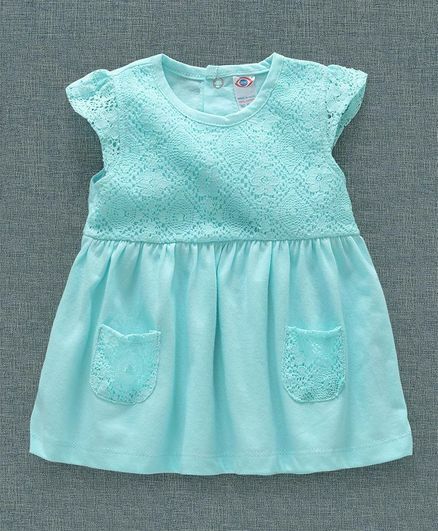 This baby frock comes with soft material (like cotton blend) perfect for summer & casual wear. But you should order one size bigger because its a bit short & for 3 months baby, 6 months size is sitting. Perfect material- js superb value worthy piece! the product is same as in picture. quality is also good. soft material comfortable for children. I ordered blue colour, 6-12 months size frock. It is very nice dress of cotton fabric and no colour fading after wash.